When night starts at about 4:30PM now it usually means it’s cold outside. I start making a big pot of soup every week to get me through dinners, and maybe even a lunch or two. 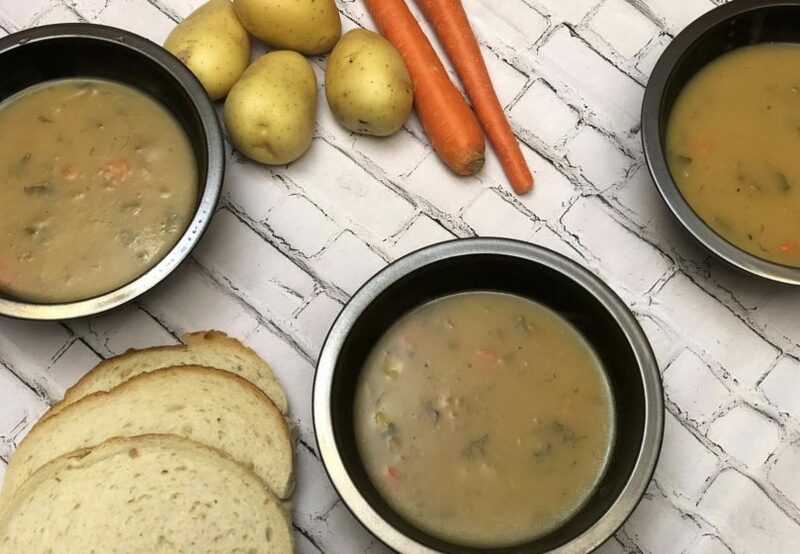 Soup is easy to make, comes together quick, the kids love it especially with croutons, and it’s healthy. Oh did I mention the kids love it. I try and come up with different soups throughout the winter. Most of my soups start with a caramelized onion. I feel this adds so much flavor to the soup without trying too hard. Some ideas that I made are classic and I know everyone will eat it and some are experiments that I like to try but I might not make them again. One classic soup that’s always a crowd pleaser is potato soup. I start with a classic mirepoix (onions, carrots, and celery) and then add the rest of my ingredient I don’t usually get too complicated with my spices most of the time the veggies flavor my soups for me. I like to add chunks of potato and carrots at the end to give texture, it’s an extra step but your mouth will appreciate the extra effort. My kids love the mini soup croutons and so do I and they taste delish with this soup. I hope you enjoy this soup as much as my family does. In a large stock pot on a medium flame add the onions and allow them to sweat for 2-3 minutes. Add the celery and two of the chopped carrots and cook for additional 5 minutes. Add 6 of the chopped potatoes and water and allow to come to a simmer. Add salt, pepper and paprika. Cook until veggies are soft. With an immersion blender purée soup until uniform and thick. You can add more water if you like it thinner. Add the remaining chunks of carrots and potatoes to give texture. Allow to cook an additional 15 minutes until the carrots and potatoes are cooked through. Finish with dill and parsley.